Not all styluses are created and developed in the same manner. Some other models do seem to function better than the rest, and the same can be said for the all new Bamboo Sketch smart stylus. What makes the Bamboo Sketch different from the others? For starters, you are able to use it to draw on iOS devices, now how about that? 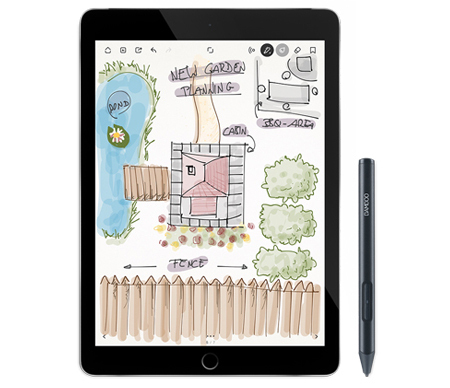 An accessory which can be used to write as well as visualize your ideas on an iPad (the iPhone would be far too small, of course), as though you were writing on pen and paper, is certainly more than welcome as it helps to increase the versatility and function of your iPad. This new smart stylus for iOS devices will target those who think in the visual format, as it offers a customizable and natural pen-on-screen experience. Since Wacom has a whole lot of experience in terms of designing digital styluses in the past, this smart stylus is perfect to complement the user experience. One can pick from a soft or firm nib, and can also customize the buttons to have their favorite commands are at their fingertips. The Bamboo Sketch has incredible pressure sensitivity, letting users write and draw in a way that looks and feels like a pen on paper. When you use it in conjunction with other compatible apps, the smart stylus will then offer 2,048 levels of pressure sensitivity. Visual thinkers who are always on the move will find the Bamboo Sketch to be a snap to tote around, since it can be stashed away and transported in a neat travel case that will also have room to spare for the replacement nibs and USB charging unit, too. No more excuse of being unable to sketch and draw anywhere now, is there? Apart from that, the Bamboo Sketch can last up to 15 hours when connected to the iPad or iPhone via Bluetooth, which should be more than enough to get you going for a full day of work. The Bamboo Sketch will retail for $79.95 and is already available for those who are interested.